A Flight For Life helicopter lands near Maroon Lake where two campers, an adult male and a juvenile male, were found dead at a nearby campsite. A lightning strike likely killed a man and a boy in their tent Tuesday night or early Wednesday near West Maroon Pass, though two other children camping with them were unhurt, authorities said. The two dead were father and son, while the two survivors were an older daughter, about 12 years old, and younger son, approximately 8 or 9 years old, who had been staying in a separate tent, according to a U.S. Forest Service volunteer who spoke with the man who found the bodies, helped report the incident and saw the children come out of the wilderness. Liss said she arrived at the Maroon Bells Visitor Center to open it up about 9:10 a.m. Wednesday. She said she had just started into her duties when a soaking-wet man from Chicago named “Dave” came running in. Dave reported that he’d been hiking and came across a tent with two bodies inside that had no vital signs, Liss said. He told her there was a stove or heater inside the tent and that burns covered one side of the father’s body, she said. Dave said that two children in a nearby tent seemed hypothermic but were being taken care of by a group of people who were camped nearby, Liss said. That group of campers walked the two children out of the wilderness. Liss said the only phone at the visitor center didn’t work, so it took a bit of time to report Dave’s information to authorities. Pitkin County emergency dispatchers received the first call about the bodies at 9:53 a.m., according to a statement from the Pitkin County Sheriff’s Office. 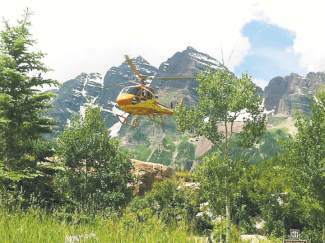 Members of Mountain Rescue Aspen were taken to the campsite, located south of West Maroon Pass at about 11,000 feet, by a Flight for Life helicopter and found the bodies. “Initial indications suggest the deaths were caused by a lightning strike,” according to the statement. They transported them down by helicopter, where they were taken by ambulance to Aspen Valley Hospital. The two children also were taken to the hospital for evaluation. Their conditions were not available Wednesday night. The names, ages and hometowns of the individuals were not released Wednesday pending notification of next of kin, the statement says. A phone message seeking further information was not returned. Dennis Phillips, a National Weather Service meteorologist in Grand Junction, said there was little, if any, precipitation in the Aspen area Tuesday night and Wednesday morning with light winds out of the southeast. He said he picked up some lightning strikes near the Maroon Bells area between 2:30 and 3:30 p.m. Tuesday, but the lightning activity appeared to drop off after that.